It’s hard to imagine why clubs overlooked Dean Kemp, the classy midfielder from Subiaco, considering his mammoth list of accomplishments at the game’s highest level. 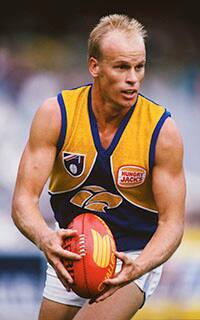 Kemp played 243 games across 12 seasons and co-captained the Eagles in 2001. Kemp had a stunning 1992 campaign in which he earned all-Australian selection, helped the Eagles win their maiden premiership and was crowned Club Champion at season's end. However, he will long be remembered for his 1994 Grand Final performance, where he tore Geelong to shreds and led West Coast to its second premiership. He subsequently won the Norm Smith Medal to boot. A member of West Coast's ‘Team of the Decade’ and ‘Team 20’, it is hard to believe Kemp slipped to what was effectively pick 117 in the 1989 draft. Kemp was awarded AFL Hall of Fame status in 2007 to cap off his stellar career.